There about forty species in the genus Muscari produce spikes of blue flowers resembling bunches of grapes - which explains the common name of grape hyacinth. The botanical name is derived either from the Turkish name for the bulb or from the Greek word 'moschos' or 'musk', referring to the scent of some species. Muscari are native to Eurasia. The two most common species in cultivation are Muscari armeniacum and Muscari botryoides. Muscari have been in cultivation in England since 1576. These lovely blue or purple bulbs bloom in early to late spring, depending on the species. They are often grown as underplanting for tulips and daffodils. Muscari flower spikes make a good contrast to the rounder shapes of those larger flowers. 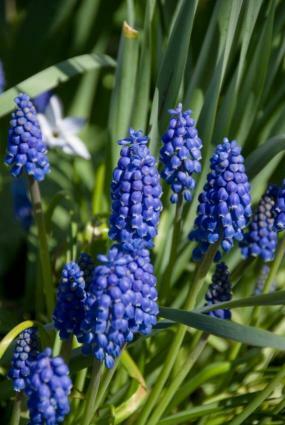 Muscari are easy bulbs to grow. They prefer full sun during their growing period, but will tolerate light shade or half-day sun. They flower early, and often have most of their growth finished before many trees are completely leafed out, which makes them suitable for a variety of sites. These bulbs prefer even moisture while they are growing, but can tolerate dry conditions when they are dormant in midsummer. They are adaptable to a wide variety of soils as long as drainage is good. Bulbs may rot in very wet soil. Grape Hyacinth are planted in early fall. The small bulbs should be spaced about three inches apart and planted about three inches deep. These bulbs require a cold period to bloom. When muscari have finished blooming, cut back the flower spikes for a tidier look. The foliage has to be left in place until it has withered so that the bulb can store nutrition for the following year's bloom. In many species, the foliage reappears in the fall and remains evergreen all winter. 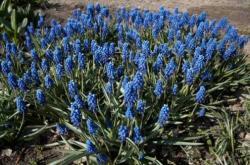 Muscari are seldom bothered by any pests or problems, including visiting animals. All parts of the plant are mildly poisonous. Muscari naturalize readily, reproducing from offsets (small new bulbs that form from the older parent bulb) or from seeds. Self-sown seed may mature with a different color flower. Muscari are beautiful in rock gardens and are often grown as underplanting for tulips and daffodils. They naturalize readily and are very pretty in a meadow or lawn. Bulbs can be forced into bloom indoors, but an artificial cold period is required.